Midland Acres announced today that Fear The Dragon's book is now full and closed for 2019. 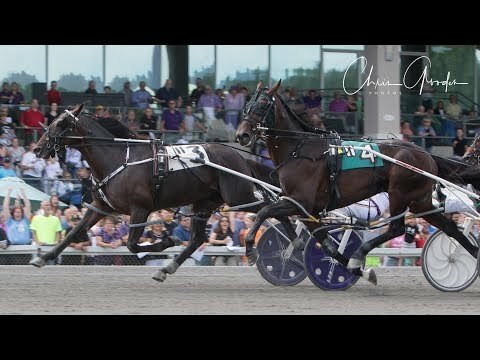 The 2017 North America Cup and multiple harness racing Grand Circuit winning son of Dragon Again's book was full and closed early in his inaugural season last year as well. Fear The Dragon p,2,1:50.3f; 3,1:48.4 ($1,578,547) is out of the prolific producer and stakes winning Western Ideal mare Armbro Cinnamon and his pedigree just keeps looking better and better. This year his 3-year-old half-brother Cinnamack also won in 1:48.1 in Lexington. Fear The Dragon's second dam is the brilliant Dan Patch Award winner Mattaroni. Bruce Trogdon of Emerald Highlands Farm is equally excited about the start that the stallion he bred, raised and raced is getting off to. Trogdon won’t have to wait long. The first Fear The Dragon foal out of one of his own mares is due Feb. 1 That will be the result of an embryo transplant from his own Dan Patch Award winner Blazin Britches p,3,1:48.4 ($575,911).